Since the turn of the twenty first century, there has been a trend for urban "mega events" to be awarded to cities and nations in the East and Global South. Such events have been viewed as economic stimulant as well as opportunities to promote national identity, gain greater international recognition and exercise a form of 'soft power.' However, there has also been on-going controversy about the value, impact and legacy of global mega events in these cities and nations. This book provides a critical examination of the ambition for spectacle that has emerged across the East and Global South. 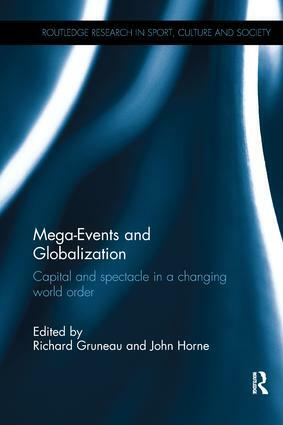 The chapters explore the theoretical and conceptual issues associated with mega-events and new forms of globalization, from the critical political economy of mega-events in a changing world order to the contested social and economic legacies of mega-events and the widespread opposition that increasingly accompanies these events. The book also explores questions of urban development and governance, the role of new communications technologies in global economic expansion, the high security State, and the growing global influence of international non-governmental organizations. This book offers a rich collection of original theoretical contributions and global case studies from leading international scholars from the social sciences and humanities. It offers a fresh and unique interdisciplinary perspective that synthesizes cutting edge research on mega-events and urban spectacles while simultaneously contributing to a broader understanding of the dynamics of global capitalism and international political power in the early twenty first century.